Expedia® has named Cabo Azul Resort among the top-ranked hotels on this year’s Expedia Insiders’ Select™ list. Expedia® has named Cabo Azul Resort among the top-ranked hotels on this year’s Expedia Insiders’ Select™ list. The Insiders’ Select list formally recognizes individual hotels worldwide that consistently deliver excellent service, a great overall experience and a notable value. The full list represents only 500 of Expedia’s top-ranked hotels selected from the more than 130,000 properties offered by Expedia®, the world’s largest online travel company. For more information about the Insider Select program, visit http://www.expedia.com/insidersselect. If you are engaged to be married or about to celebrate a special anniversary, Cabo Azul Resort would be happy to have you celebrate your wedding, honeymoon, or anniversary at this award winning resort. Visit http://caboazulresort.com to see what we have to offer. Cabo Azul Resort is a beachfront luxury property at the tip of Baja California and has been awarded a four-diamond rating of excellence from AAA. Our fabulous Corazon chapel, which overlooks the Sea of Cortez, is a purpose built $14 Million open air chapel. It is an architectural gem perfect for your Mexico destination wedding. Call us toll free (866) 653-9108 to talk to our Celebration Specialist to see if Cabo Azul Resort is right for you. 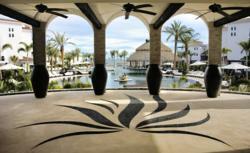 Also, visit http://caboazulresort.com to learn more about our resort.